The first book of the Fire-Rider saga has been published in three volumes, The Saga Begins, Fire and Ice, and Homeward Bound. Each is available from Amazon in Kindle format or here at Plain & Simple Press as handsome paperbacks. Meanwhile, more is on the way. Fire-Rider, an epic that takes place in a future ice age known to the even more distant future as “The Great Lacuna,” is related by Hapa Cottrite, an itinerant learned man and one of the very few of his times who can read and write. His journals, found in a remote cave in the dry sheepherding country of northern Vada and interpreted by Estabanya Marcanda do Tilár i Robintál do Nomanto Berdo, master storyteller of the Methgoan Academy of Written and Oral Performance , provide the material for the Fire-Rider stories. Marcanda do Tilár based her retelling of the story on the definitive translation by Fontano do Caz Eviatád, sponsored by the Western Regional Council of Research Sciences and the Institute for Theory of Intuitional Dissemination (TID) Studies. Parts of the next book are direct translations of Cottrite’s journals and parts are narrative interpretations by Marcanda do Tilár. Here would I like to record my gratitude to the Brez Lhored Kubna of Grisham Lekvel for the care he and his men took of me while we journeyed north from Lek Doe into the lands of the Okan. Though the people in the south justifiably think of the Hengliss tribes as backward, unruly, and bloodthirsty savages, they can be surpassing generous to those they perceive as friends or guests. 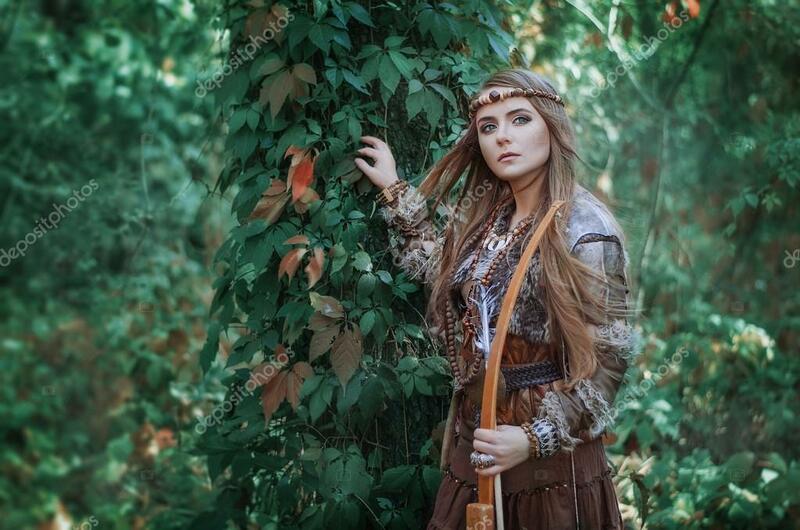 At the outset, as we prepared to leave Lek Doe and head down the trail that would take us out of the Sehrras and toward the land of Okan, Lhored of Grisham Lekvel asked if I would walk with him and his party. That offer, of course, I accepted, and so daily did I find myself in the company of the Okan warlord’s closest men. The Hengliss title of brez sounds a little like our word brezidiente. However, a brez is something very different from a Socaliniero hereditary ruler. The Okan have no line of succession for their highest headman, except insofar as the warriors from whose ranks the brez is selected do indeed inherit (or marry into) their titles. 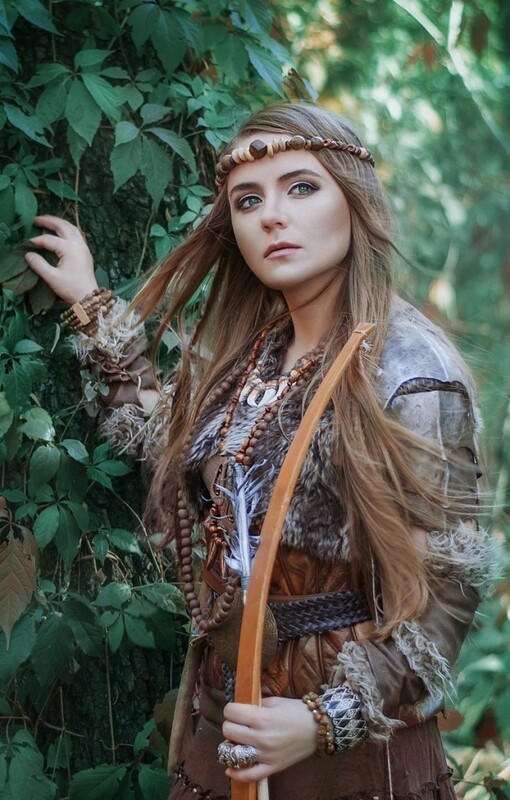 A brez is selected by a gonsa (a kind of council) consisting of all the stae’’s kubnas and mayrs, a priest or two, and the occasional shamanistic seer. The brez himself is usually a kubna, although some in the past have been mayrs. At the end of a set period, a reigning brez is dispatched to his Heavenly Father and a new one is selected. This bizarre custom, from which we take our understanding that the northern tribes practice human sacrifice, stems from the even more bizarre belief that the brez is the physical incarnation of godhead on earth. As the Okan put it, he is thought to be the “son of God.” In the strange construct that is the primitives’ religion, God, or (as far as I can tell) some aspect of Godhead, comes into this world periodically to inhabit a single human being and to lead His chosen people from day to day. After so many years, he returns to the other world—Heaven, presumably—and shortly thereafter comes back to take up residence in the corporeal body of the next brez. Lhored is a sturdy, fit man but not one that I would think of as the receptacle of divinity. Who knows, though, how the Divine would choose to incarnate Himself on earth? Maybe He feels a blue-eyed Okan barbarian going to grey in the beard is a vessel as good as any. Before we left Lek Doe, the Brez Lhored took it upon himself to decide where I would sleep during the trek north, and with whom. 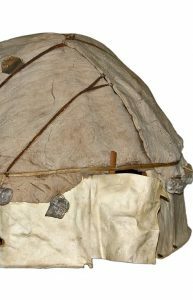 The Okan carry with them a type of tent that they call a lodge. For the foot soldiers and freighters, these come in the form of long, narrow shelters that can accommodate about fifty to seventy men. But the mayrs and kubnas who command the men each bring a private lodge that provides room for a single man and possibly two others, plus some gear. Space in these is fairly tight, as the structure is small enough and light enough to fold up and load aboard a pack horse. He would, said Lhored, lend me the use of Mitchel Kubna of Cham Fos’s lodge, since Mitchel is no longer on this earth to occupy it. With pleasure I accepted, for the cramped quarters and the rough company in the barracks lodges looked less than inviting. Yet an Okan lodge is so different from the light Socaliniero tents our people carry into the field, I had no idea how to put up such a thing or take it down. My expression must have said so. Shortly, he called one of the young Socaliniero camp followers over. Duarto, a tall, slender fellow with dark brown sloe eyes, a stippling of brand-new beard beginning to shade his jaw, and a sensual masculine grace about him, looked me frankly in the face and greeted me by name, in the Hengliss style: “Mister Cottrite.” In spite of his openness, something about him felt subdued. He spoke quietly, as though that two-word greeting were an effort. We shook hands, and the brez continued, “Duarto was Mitch’s lad. He knows everything there is to know about this lodge, and about the gear that goes with it. You can use whatever you need of Mitch’s to make yourself comfortable. Duarto will help you out with it. “Agreed?” he asked the young man. By his tone, you could tell there was only one answer. “Aw, no, Lhored. Please no, sir.” Duarto spoke, but looked like he wished he could call his words back. “What?” A faint frown darkened the brez’s face, the slightest tightening around the mouth, a lifted eyebrow. This, as one might guess, was not a man accustomed to being gainsaid. But as fast as it came, that hint of annoyance passed. “That’s not what I meant,” said Duarto. “Me, neither,” the other page, Alber, said before Lhored could respond to this. “Don’t be ridiculous,” Lhored scoffed. “There’s no ghosts in that lodge. How can there be a ghost in it? It’s knocked down and folded up.” This theory sounded a little desperate, I thought. The boys weren’t buying it. “Duarto saw it,” Lonneh said. “He said so,” Alber added. “No, I didn’t,” Duarto said. “Enough from you, Duarto!” Lhored gave him a sharp look. Duarto subsided and stepped behind me. “Oh, you do want it now?” He reached out and grabbed Alber by the arm. “We shouldn’t use that lodge at all,” a third said. “We ought to burn it,” the first man added. “If it’s got a haunt in it, we ought not to take it with us,” the third man said. Here was an interesting development. We’re told the Hengliss northerners enjoy some colorful superstitions. Now, before we could even leave the town, an opportunity to observe one such arose. In due course, Kaybrel came striding up, young Alber tagging after him. This kubna, the lord of Moor Lek, is a gray eminence among the Okan leaders, the eldest of them (I believe) and one longing, without much secrecy, to retire from the field. Yet just weeks ago, the man earned the title “Fire-Rider” by his already legendary nerve in leading the men of Okan and A’o through a wall of flames set by their pursuing enemies. 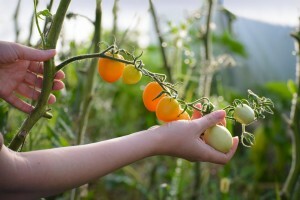 Among his various distinctions, Kaybrel is tocha—a healer, roughly like our gorandero. But tocha is slightly different: the Okan healer is believed to speak directly to the spirit world, and that contact or inspiration is what makes it possible for him to work his healing magic. Or hers: most Okan healers are women. At any rate, that gift of spirit-speaking no doubt is why the brez called upon the man to deal with the present upset. Lhored explained the situation—how the men and boys came to imagine the late Kubna of Cham Fos’s tent was occupied by ghosts and that a rite was needed to clear away any evil spirits. Standing next to him, I heard Kaybrel release a soft sigh through his nose, unnoticed by anyone who was more than a few feet away. The two trotted off in search of Kaybrel’s servant. The rest of us began to walk toward the back of the long line of men, where the wagons were gathered. “What the devil were you thinking, telling people that thing is haunted?” Kaybrel asked. “I’m sorry, Kay.” He looked utterly downcast. “Yeah. I did,” Duarto said. At this, Duarto smiled wanly. Duarto looked up at him, something like curiosity in his glance, and nodded. Kaybrel gave him a friendly slap on the shoulder and rejoined the group of Okan men. The kubna, I noticed, speaks Espanyo with great fluency. 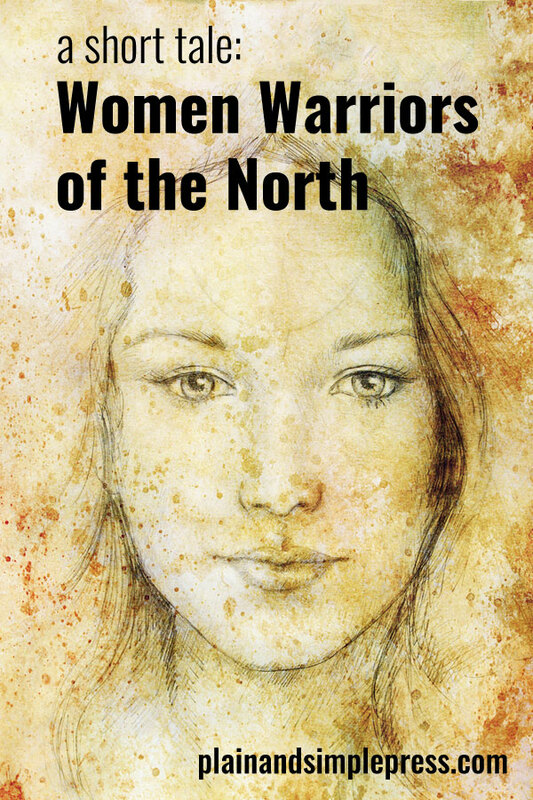 Rare it is to come across one of the northerners who can both understand and speak the language of civilization. It also struck me, in hearing his short exchange with the young man Duarto, that he had something of the lilt and lift of Roksan, the very city these A’oan and Okan bands sacked and leveled not so long ago. It’s odd, I think, and bears study. The northern warlords have the odd custom of loading their great chargers—which are, one must avow, superb animals—with gear and then walking instead of riding. In contrast with Socaliniero war parties, whose cavalrymen always ride while their impressed foot soldiers walk, these chieftains march on foot with their men. Each kubna and mayr has one or two ponies that carry most of his camping gear and weaponry; he loads the rest on his charger, in packs that can be released from the saddle with a single yank of a line. He keeps his war horse with him as he marches. If he happens to have a camp boy or, like Lhored, an apprentice or two, his sidekick will lead the pack pony and the charger. If not, he consigns his loaded pack pony to a small herd of stock wrangled by a pair of drovers, which brings up the rear of the long train of men and wagons. Men and a few boys began to collect around the supply wagons as Lhored, Kaybrel, and we various hangers-on approached. The brez stepped onto a low wooden crate, lifting himself a head above the crowd. Right about then a slender lad, about fourteen or sixteen years old, came up to Kaybrel and handed over a black canvas bag. The kubna thanked him and set the sack on the ground. “What’s going on?” the newcomer asked Kaybrel in Espanyo. The moment he spoke he marked himself as Roksando. “I’ll tell you about it later, Tavi,” Kaybrel said quietly. This one, who I later learned is named Ottavio Ombertín and who indeed did come from Roksan, is a striking young fellow, at once boy-like and strangely handsome. Clearly a child of the southern provinces, with high indio cheekbones and a deep reddish-tan complexion, he has hair the color of copper and chestnut-brown eyes that pick up the same tone. At first I thought he was a redhead, but then realized he didn’t have the typical light skin and freckles. It’s more accurate to say his coloring is an unusual shade of brown, lighter than auburn but not carrot-red. “We thank you, Father, for the kindness of the many good people of Lek Doe and ask your blessing for these gifts of supplies, food, tools, and livestock they have offered us. “We thank our friends at Lek Doe, the seeyo, her boda’ drectahs, the pastors of her faith and ours, and all of the merchants, craftsmen, growers, hunters, fishers, and builders who brought us these fine things. We thank them for the gracious and loving funeral ceremony they made for our beloved cousin, Mitchel of Cham Fos. “May Lek Doe receive Your grace. May its people prosper, and may they live in peace, now and forever. “May the Seeyo Babra Puehkins and each of her drectahs find favor with You, O God, and may You prosper them and their offspring. Simple, but surprisingly all-encompassing. I wondered if he had come up with this for my benefit. If I had a faint doubt, it was brought into focus by what followed. For, said he, “Gentlemen. 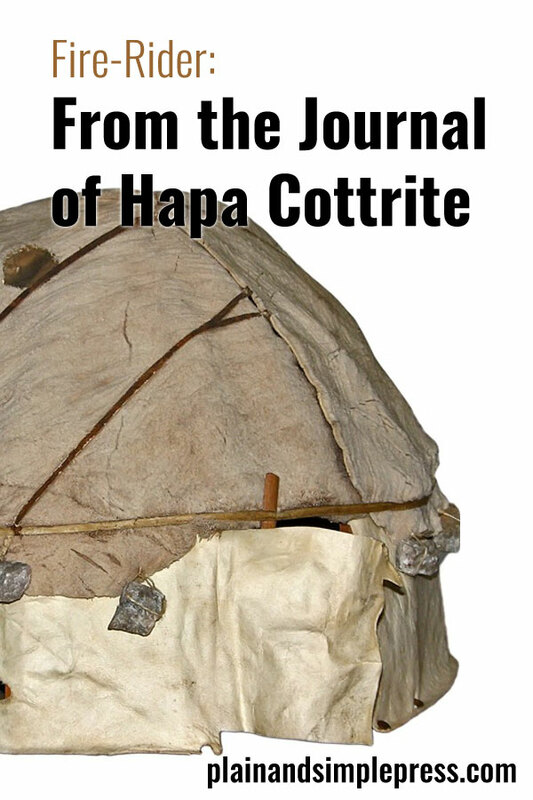 I’d like you to meet and come to know Hapa Cottrite, our guest from Lek Doe.” He made a point of calling me forward so as to display me to all concerned and unconcerned. In the pause he allowed, men clapped their hands, stomped their feet, and hooted. Some puzzled grumbling drifted back from the men. Frustrated expressions all around from those who were anxious to get on the road. Duarto shot Kaybrel a glance; the kubna maintained a studied blandness. While several men of Cham Fos helped the disgruntled driver unload the large and solidly packed wagon, Kaybrel laid out some tools: a carved stone bowl into which a smaller metal bowl was set, a couple of wax fuel wafers, some tinder, a handful or two of kindling and small sticks, a flint, a steel, a piece of charcoal, and—interestingly—a small handsomely carved and finished wooden flute. He assembled the fire makings inside the metal bowl and waited. When at last the late Kubna Mitchel’s lodge was found and hauled out of the wagon, Kaybrel beckoned Duarto to help him set up the tent. Conspicuously, none of the other men or boys would go near it. Whether they believed it harbored a ghost or not, none of them would take any chances. Expertly, our warrior who was also a healer and also a shaman struck the flint and lit a fire in the bowl. “You can play this thing, no?” he asked Duarto, holding up the flute. “F’shua,” Duarto said. The Espanyo camp boys use a variety of Hengliss and Espanyo slang terms. This one I had not heard before, but it appears to be a Hengliss equivalent of glaro or así. “All right, gentlemen,” he now addressed the assembled men, who had gathered in a semicircle around the wagon and tent. “I’m going to get the spirit’s attention first. Then we’ll sing a chant. To protect us all and also to send this spirit on its way, you’ll need to keep the chant going while I perform the ceremony. Another murmur of assent rose in reply. “God’s Son, bring us to your Father. “God have mercy on us. “God’s Son, bring us your protection. “God call this spirit home. He made them rehearse the words after him a couple of times, and then he played a plain chant melody on the flute so they could hear it once. He handed the flute to Duarto, asked him to play the tune, and sang the words again as Duarto reproduced the melody fluently. This Kubna Kaybrel of Moor Lek is a man of middling stature, neither short nor very tall, well-built, muscular and sturdy. His hair and curly beard, both a dusty shade of brown like that of many northerners, run to gray — shot through with silver. He wears his shoulder-length hair neatly combed and tied back in a queue with a length of rawhide, his homespun shirt and trousers loose and made for walking or riding, a broad-brimmed brown felt hat shading his gray-green eyes from the day’s sun. Nothing about him could I see that set him apart, physically, from the rest of the Okan and A’oan men around him. If there was anything of the sorcerer in him, it wasn’t visible to the human eye. Retrieving the flute from Duarto, he stepped to the front of the lodge, whose entry flaps had been tied open, and placed his lips to the instrument’s mouthpiece. There followed a strange, atonal series of notes, rising and falling from lower to higher registers, at moments deep in the alto range, at others shrill—seemingly at random. The effect, it must be said, was weird, even eerie. The assembly fell silent. When this prelude ended, only the testy shriek of a camp jay and a light breeze whispering through the pines broke the ensuing silence. Kaybrel handed the flute back to Duarto. Then he picked up the flaming bowl, which he held at head-height in extended hands. Duarto began to play the chant and the gathered men and boys to sing its verses, in unison. A strong odor of eucalyptus-scented incense drifted over us with the smoke. I realized the wax fuel wafers must have been perfumed with it. The kubna dropped one into the inner bowl when he took the fire into his hands, causing the flames to flare and the incense to rise. “Spirit! O spirit!” he intoned loudly. “Hear me now, if you will!” He waved the firebowl in the direction of the tent, wafting the odoriferous smoke toward and presumably into the open entrance. No answer forthcoming, he continued, “I who am tocha would speak with you. 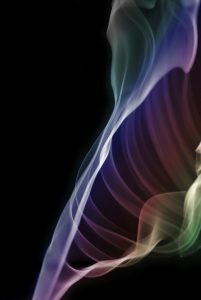 He waved the smoking bowl toward the entry again and then gave it a few swirls, spreading the eye-wateringly fragrant incense over all who stood nearby. Now he paced all the way around the tent, still waving and agitating the flaming bowl and sending the perfumed smoke into the air. The Okans continued the chant through all this, steady and rhythmic. He took the bowl in his left hand and passed his right hand over the fire. Instantly the flames flared upward with a brilliant green light. At this, a few of the men hesitated in their chanting. 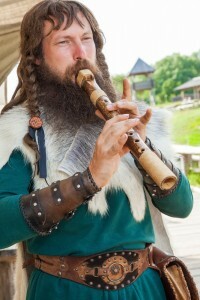 Lhored urged them on, singing louder and waving his arms to the flute’s metered melody. Kaybrel stopped speaking, and shortly the fire in the bowl died out. He allowed the chant to continue a few minutes more and then gestured to Duarto and Lhored to bring a stop to it. The men fell to milling about and speaking amongst each other. Duarto skulked. The one called Tavio, who had looked on wide-eyed throughout the rite, began to clean up and repack the kubna’s spirit-cleansing implements. “Now,” Kaybrel said to Lhored, firmly enough to be heard by all concerned, “this lodge is free of any lingering spirits or airs. It’s perfectly safe for anyone to use. Agreed?” He cocked an eyebrow in the direction of one of Lhored’s Hengliss lads, who appeared no less awed than his own Espanyo boy did. “Good,” Lhored replied. “You two chuckleheads,” he turned to the pages, “take this thing back down, put it together, and then give Sam’l a hand at repacking that wagon. “Sorry about the nuisance,” Lhored said, more, I thought, to Kaybrel than to me. “That’s kind of you, Kay,” Lhored replied. “But Lonneh is going to do the job I gave him in the first place. Isn’t he?” With this, the brez eyed his elder page. We walked back toward the front of the line, our progress slowed when one man, two men, small groups of men greeted us and introduced themselves to me. I wondered how I was to remember all their names, but evidently that wasn’t the point. More to the point was that they would remember me, or at least my face, and not dispatch me should we encounter the bands from Loma Alda—or any other gangs of patgais—after we left the protected city of Lek Doe. The sun had climbed a third of the way to the zenith by the time Lonneh and Alber came trotting up from the tail end of the waiting company to report that all was loaded and secured. At last the brez gave the order to move out! All the way down the long column men got to their feet, shouldered day packs, and fell in with companions. The voices of the kubnas’ monjas—their lieutenants in charge of wrangling each cowndee’s bands—echoed down the line as each repeated the order at the top of his lungs. Redundant, it was: no one needed any urging to get on the road. We crest the low rise just beyond Lek Doe and start down the trail that will take us off the steep eastern face to the bajadas of the Sehrra Muns. The wide brown desert basin beyond the Sehrras stretches out below us, as far as a man can see, fading to blue in the distance, where lower mountains punctuate the plain. A high bluff to one side of the road harbors a flock of swifts. Startling it is to see the graceful little birds whipping through the void at our eye level, a great chasm open below them—and us. Further off, a red-tailed hawk sails a wind current through a sky as blue as the deeps of the lake itself. Flaxen grass bends and waves in the breeze that drops down off the pass. The cool wind pushing us down the mountain carries the scent of horse and dust and sweat. Wagons creak and rattle; horses’ hooves and men’s boots pound the road. So it begins: another journey, another adventure. Did you enjoy this coming attraction from a future Fire-Rider novel? Curious about the world that Kaybrel and his people inhabit? 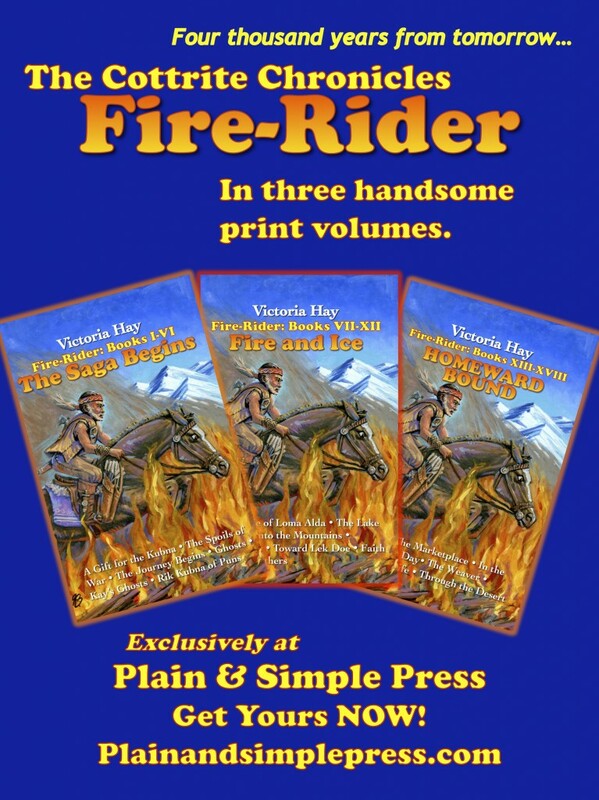 The first three volumes of the Fire-Rider saga can be found at Amazon, or if you prefer to touch paper when you read your books, here at Plain & Simple Press. Lose yourself in a future world — you may never want to come back. © 2016 Millicent Victoria Hay. All rights reserved. This entry was posted in Fire-Rider on July 12, 2016 by funny. This riff continues the story of Lieze Mayreth of Rozebek and her husband Jag Bova, late dubbed “Snow-Killer” for his heroics after the Battle of Loma Alda. At last the war bands have returned from their long and heartbreaking summer warfare. Their waiting family and friends greet those who have survived with joy. Shortly after midday, Jag Bova’s bands of weary, road-worn men crested the pass through the low hills that rose above Rozebek Town. Larks whistled in the hilltop forest, and a squirrel, still busy stashing acorns and pine nuts for winter, chattered as the men hiked past them. A hawk drifted overhead, looking for all the world like idle curiosity brought it to watching the procession pass. The autumn afternoon was clear and crisp beneath a sapphire sky, unblemished but for a few distant, fluffy clouds. 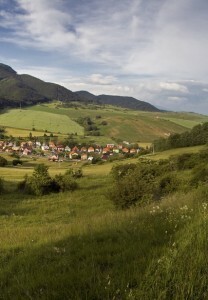 Below lay farmlands, pasture, and the town of Rozebek, dominated by its mayr’s keep. 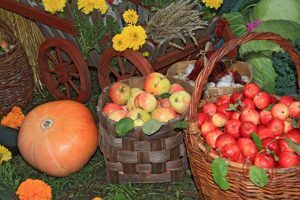 In the orchards, apple and walnut trees had already dropped their leaves, but here and there a maple or a pear clung to its scarlet and gold. When he saw the village spread out before them, Bova felt his heart rise. 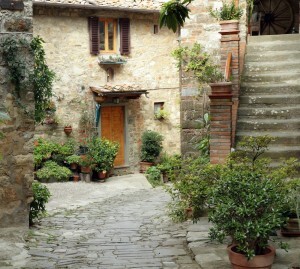 Narrow lanes led out from the town plaza like spokes on a wagon wheel, the spaces between them filled with stone houses built four and six and sometimes even eight to a compound. Huddled together around common walls, the dwellings gained a little extra shelter from winter’s deepest cold. And there, wrapped within the village, stood his own home, Rozebek Keep. 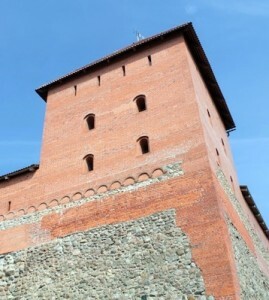 Its high defensive fortifications were built of local gray stone, as was his private family compound’s tower that rose above the stokhed walls. Alone among the Okan aristocracy’s fortifications, the Mayr of Rozebek’s keep formed a part of its village. The people’s homes came right up to the moat, making the keep an island in a small lake of human activity. Usually a kubnath’s or a mayr’s keep and dwelling stood atop a low rise anywhere from half a mile to two miles from its village. This difference pleased Jag Bova. If anyone disapproved, they hadn’t ventured to complain. A fieldstone watch tower stood at the height of the pass. Three villagers came out of the door at ground level to greet the arriving fighters. The first, a wiry youth barely more than a boy and not quite a young man, fairly bounced up the road. “Mister Mayr! Mr. Samel! God bless you.” He bounded over and shook first Bova’s hand, then Samel’s. The men at the front of the line pushed forward, pleased to see the first of their kin and friends that they’d laid eyes on in five months. Shortly behind the lad came a tall, lank, and wrinkled woman clad in rough-cut homespun pants and shirt, her grey hair straggling out beneath a knitted woolen cap. She advanced to Bova with arms extended and wrapped him in a hearty hug. A ripple of subdued laughter murmured through the men within earshot. “Sure they are, lad” Bova replied. “They’ll be down the line a ways.” Rand made his way up the trail to find his returning relatives. “And Willard? Did you bring my grandson back to me, Jag Bova?” Belindeh asked. Belindeh and Willard spotted each other in the same moment and fell into each others’ arms. His monja nodded and smiled grimly. “Tough campaign, was it?” the old man asked, overhearing this. A distant sound wafted up the hillside: music. Horns and fiddles, drums and tambourines, whistles and ghitters and recorders and pipes rose a merry clamor down in the village. Semel, Bova’s monja, grinned when he heard the racket. “The party’s started without us,” he said. “Little Mama’s a-callin’,” another voice exclaimed. Here and there, men broke out of line and started to jog ahead. “Get a grip on those clowns,” Bova said to Semel. “Whoa! Settle down there!” Semel shouted. A few marchers, rowdy and not inclined to settle anywhere just then, gave him puzzled glances. “What’ve you got in mind, Mister Mayr?” a grizzled fellow on the sidelines hollered back. A ripple of laughter washed over the company closest to Bova and Semel. 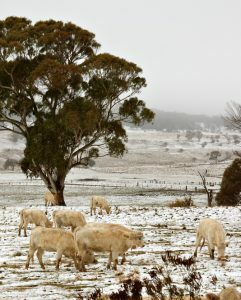 “That’ll give the girls something to remember through the winter nights,” someone remarked. The bands began to fall into rough columns, and shortly two men with small bagpipes, a couple of drummers, and a fife player gathered at the head of the company. Meanwhile, Bova lifted bags of gear off his charger, loaded them on a pack pony, and climbed into the saddle. Semel scouted up company’s banner, unfurled it from its pole, and handed it up to Bova, who secured it to its saddle. It waved cheerfully in the crystalline air. The pipers and fifer struck up a bright marching tune, and the men hiked down the hill, more spring in their step than had been seen for some time. The wounded rode in the supply wagons, a few, those who could sit up and speak, chatting with their comrades on foot. The mood overall: celebratory. As the troops approached Rozebek Town, villagers poured out onto the road, where they danced to the sound of fiddles, drums, and horns. Women, children, and old men streamed into the band of weary, rag-tag men. Shouts of joy and relief rang out when families and loved ones found each other, but a few called out names repeatedly and got no response. Soon enough, Bova found Lieze, Ada, and his three children proceeding up the road amid a knot of followers and friends. The instant Lieze spotted Bova, she ran through the crowd to meet him. Lieze wrapped her arms around her massive husband. He sank his face in her long chestnut hair, which she had allowed to flow loose for the occasion. He kissed her face delicately, then planted a passionate kiss on her lips. Nearby several men cheered. Lieze blushed and looked into his blue eyes. Bova took her hands and spun her about in an exuberant circle. Ada approached with the three children at her side. “Welcome home, son,” she said. Bova grinned and hugged his children’s grandmother. The three kids could no longer restrain themselves. Deke leapt on his father, who lifted him, laughing, into the air. Then Bova set him on the ground and greeted each child with a hug and a kiss. Mandeh and Deke chattered excitedly while Erysa looked on, dignified. The party of townspeople drifted toward the town’s central park and cobbled square, where the music and dancing went on. After some time, Lieze began to lobby to return to the keep. Several bystanders laughed. Mandeh rolled her eyes heavenward. Erysa smiled and executed an exaggerated but graceful bow. “What can’t wait until tomorrow?” she asked. “Oh, dear God,” Lieze gasped. This entry was posted in Fire-Rider, Monthly Riff on July 3, 2016 by funny. Here’s a draft passage from an upcoming installment in the Fire-Rider series. Enjoy! 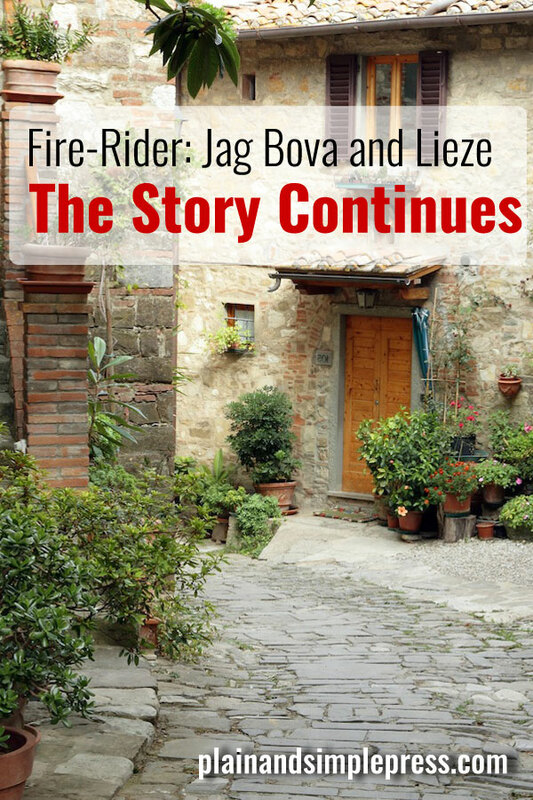 Lieze and Jag Bova stood in the window of their upstairs bedroom, watching Deke and Mandeh play hide and seek with a couple of the neighbors’ kids around the courtyard and stone outbuildings below. Erysa and Ada had gone to the village marketplace to shop and socialize. Bova held his wife in his arms and smiled, contented for the first time in several months. Now that things were quiet and the two had renewed their acquaintance in every way, Bova saw an opportunity to bring up an idea that had been rolling around in his mind for some time. “Isn’t it a shame?” Lieze said. …hard to impress the boys with your pesty little brother underfoot. Excellent woman, Bova thought: he wouldn’t have to plow new ground. “So…what do you think of the idea?” he asked. “She’s a little young,” Lieze replied. Bova steered Lieze to the window seat, and, with a gesture, invited her to sit down, then settled on the padded bench beside her. He cleared his throat. “I do have a thought, yes,” he said. “Well, in the field this summer I built a pretty strong link with Kaybrel Kubna of Moor Lek. And you know, with Rik gone and his son two or three years short of taking over as our kubna, an alliance with Moor Lek wouldn’t be a bad thing for the House of Rozebek. Lieze was quiet for what seemed to Bova like a long time. “She’d be well taken care of, though,” Bova said. If she were widowed after she had a child of the kubna’s, she would not remarry until his offspring were grown or settled elsewhere. Neither would Kay’s kubnath, Maire. Between the two of them, they would live handsomely on the income from an entire cowndee’s splits. Plus of course Maire was collecting from Silba Lek, too. Okan kubnath…good because she’s absolutely fierce. “I’m sure,” Lieze countered. “And that brings us to the next point: I don’t want my eldest daughter to play second fiddle to someone like Maire Kubnath of Silba Lek and Moor Lek. She would fade right into the shrubbery. “No one has ever complained that she’s not a good kubnath,” Bova remarked. “I’ve never found him especially fierce,” she said. “Fal?” Bova was nonplussed. The thought had never entered his mind. “Hmh.” He turned the possibility over in his mind. She raised an eyebrow. “Is that so?” He nodded. “Well, no doubt he’s not alone in that,” she remarked. “I daydream about getting back to you every summer,” he said. He lifted her hand to his lips and kissed his way up her arm to the nape of her neck. She shivered, sighed, and melted into his arms. A kiss or two later, Bova glanced up. “Oh, God,” he said. “Yonder come the women young and old.” Ada and Erysa were entering the courtyard below, driving a small carriage behind a single pony. 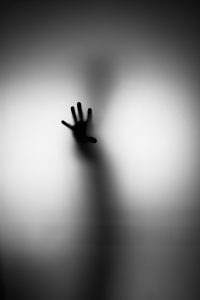 “We’d better get out of the window, then.” He took her hand and, like shadows, the two ghosted into an upstairs guest bedroom. This entry was posted in Fire-Rider and tagged Fire-Rider excerpt, science fiction on June 16, 2016 by funny. A client, needing to do rewrites of several chapters, suddenly felt a bit stymied. Mostly, I think, this happened because he was feeling tired and impatient to get finished. The end was in sight, and he really just wanted to get the book done! While we were thinking about how he could re-energize himself for the last sprint, an Insight! occurred to me. And it’s an insight that appears to work. Before inflicting it on him, I experimented with it on a passage of my own novel, where I also had run out of gas, dropped the narrative, and moved on to a new passage in hopes of trudging back later with a fuel can in hand. 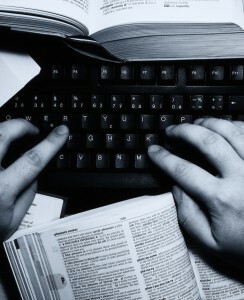 Here’s the idea: Let’s say you’re writing in prose — could be fiction or nonfiction. For the nonce, let’s call it fiction. This requires you to use a set of techniques specific to the genre at hand. In the case of fiction, these would be dialogue, narrative, description, setting, characterization, point of view, and the like. When you feel you simply can NOT move forward with a scene, try writing that scene in some other genre. Instead of prose fiction, what if you wrote the passage as a scene in a stage play or a movie script? What if you wrote it in verse? What if you wrote it as a letter from one of the characters to one of the other characters? Or as a letter from you to your best friend? With fresh ideas and action on paper, now go back and convert what you’ve written into the genre you’re actually writing. Different genres require different writing techniques. Engaging these different modes requires you to engage a different set of mental skills and attitudes. 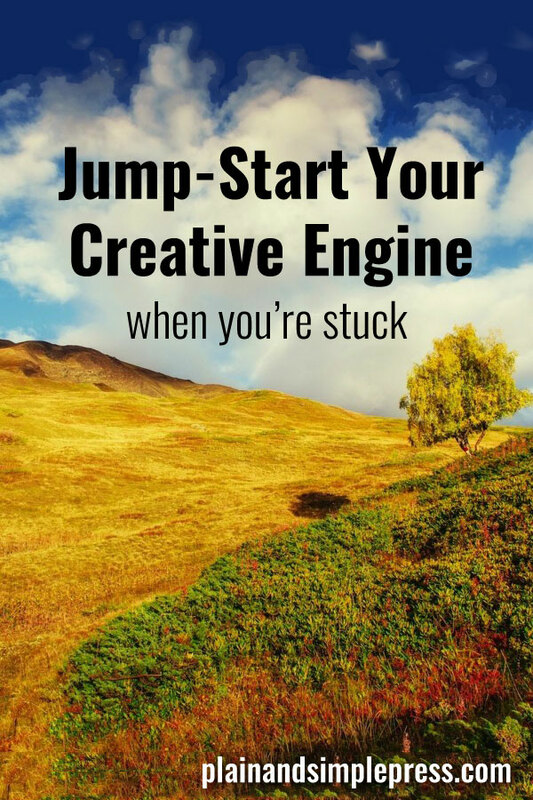 If you take what you want to say and write it in a different genre, you force yourself to shift gears. Let’s see how this worked on the passage of mine that ran out of energy. Shortly after midday, Jag Bova’s bands crested the pass through the low hills that cradled the southest end of Rozebek Town. Warm as an Indian summer, the pleasant autumn afternoon was still and clear. A sapphire sky, unblemished but for a few distant, fluffy clouds, rested over the brown and gilded farmlands below. In the orchards, apple and walnut trees had already dropped their leaves, but here and there a maple or a pear clung to its scarlet and gold. When he saw the village spread out before them, Bova’s heart filled with joy. Narrow lanes led out from the town plaza like spokes on a wagon wheel, the spaces between them filled with stone houses built four and six and sometimes even eight to a compound. Huddled together around common walls, the dwellings gained a little extra shelter from winter’s deepest cold. And there, entwined within the village, stood his own home, Rozebek Keep. Its high defensive fortifications were built of local gray stone, as was his private family compound’s tower that rose above the stokhed walls. Semel, [WHAT DOES HE LOOK LIKE?] Bova’s monja, grinned when he heard the racket. “The party’s started without us,” he said. “Little Mama’s a-callin’,” another voice exclaimed. Here and there, men broke out of line and started to run or jog ahead. The band began to fall into rough columns, and shortly two men with small bagpipes, a couple of drummers, and a fife player gathered at the head of the company. Meanwhile, Bova lifted bags of gear off his charger, loaded them on a pack pony, and climbed into the saddle. Semel scouted up company’s banner, unfurled it from its pole, and handed it up to Bova, who secured it to its saddle, where it waved cheerfully in the crystalline air. Where did the words GO???? Zzzzzz…. This was where I fell asleep. Gave up. Wrote the second half of the chapter. Went on to some other client’s work. Sent a bill. Came back. Gave up. Did some other paying work. Graded student papers. Came back…and so on. I simply could NOT get past this scene or move on to the next one. 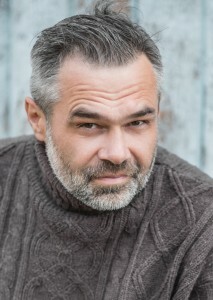 JAG BOVA MAYR OF ROZEBEK, late the recipient of the honorific “Snow-Killer,” a massive chunk of a man with blond hair and a thick, curly blond beard. LIEZE MAYRETH OF ROZEBEK: Bova’s only wife; in her early 30s, plump, pretty, and self-contained. ERYSA: Bova and Lieze’s elder daughter, a pretty young woman of about 16, as blonde as her father. The crest of a low hill above a fertile valley. At the forested hilltop, birds sing, squirrels call, and a hawk drifts overhead as if watching the procession. Below lie farmlands, pasture, and the town of Rozebek, dominated by its mayr’s keep. The time is past noon on a clear, crisp autumn day. JAG BOVA and SAMEL are leading their rag-tag band of FIGHTING MEN, all of whom are tired and anxious to get home. 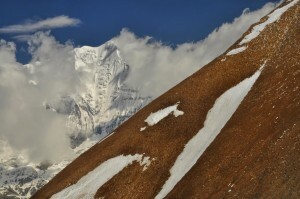 As they reach the trail’s summit, they pass a stone watchtower. Its occupants, RAND, BELINDEH, and CAMMISH turn out to welcome them. RAND is a teenaged boy, BELINDEH a hungry-looking middle-aged woman, and CAMMISH, an old man. They are all dressed in the homespun clothing of the time and place. Like the men, BELINDEH wears rough work dungarees rather than a skirt. Mister Mayr! Mr. Samel! God bless you! BELINDEH, following RAND by some yards, advances to BOVA with arms extended and hugs him. Thank God you’re home. Thank God! BOVA shakes RAND’s hand while he’s being hugged by BELINDEH. CAMMISH, supported by a walking stick and hobbling after the other two, takes SAMEL’s hand and then BOVA’s. Where’ve you been, boys? We’ve been waiting dinner for you so long the food’s gone cold! Where are my brothers? Are they with you, mayr? Sure they are, lad. They’ll be down the line a ways. RAND starts to make his way along the trail in search of his returning brothers. And Willard? Did you bring my grandson back to me, Jag Bova? Yes, ma’am. And hale and hearty he is. In fact, yonder he comes—in search of you, I reckon! BELINDEH and WILLARD spot each other at the same moment and fall into each others’ arms. Getting all three of them back here alive and in one piece is more than a small favor, Sam. SAMEL responds with an affirmative nod and a grim smile. Yessir, Mister Cammish. That it was. You’ll be hearing about it soon. And all winter long, I expect. I’m sorry to learn that, Jag Bova. How many men did we lose? If you don’t mind my asking? Thirty-eight. That’s the ones who made it into the other world. More are coming home wounded. They’ll take some time to heal. Those that ever do. CAMMISH falls silent briefly, staring toward the village below. The boy has already ridden into town on his mule, a-spreadin’ the word that you men be coming up the road. 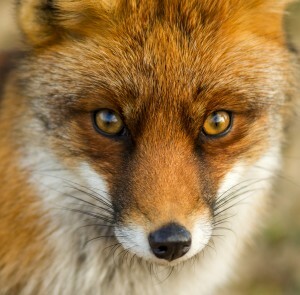 Then he come back to greet you all, looking for his brothers. Listen to that racket down there! From the distant valley, a sound of music and celebration reverberates up the hillside. The men toward the front who can hear it laugh and jostle. BOVA and SEMEL also smile and look pleased. The party’s started without us. Let’s get our asses down there! Don’t want to miss any more than we have to. MEN break ranks and begin to run or jog ahead, down the trail. Get a grip on those clowns! Several MEN give SEMEL puzzled glances. BOVA, swaggering in front of the restless MEN. “Now listen to that, boys! The folks have brought out the band for us. What d’you say we return the favor? What’ve you got in mind, Mister Mayr? Let’s play them a tune or three of our own. Let’s us get ourselves lined up here like respectable gents, and Semel, call the pipers and the drummers and let’s pipe the men to town! That’ll give the girls something to remember through the winter nights. That it will. Into columns! Where are those pipers? MEN begin to assemble into rough columns while BOVA moves bags from his war horse to a pack pony. Two MEN with small bagpipes approach, followed by two drummers and a fife player. BOVA mounts his horse, and SEMEL hands a banner up to him. BOVA secures it to his saddle. It waves in the light breeze. PIPERS, FIFER, and DRUMMERS strike up a bright marching tune. They march down the hill in a celebratory mood, the wounded riding in supply wagons. As they approach the town, TOWNSPEOPLE come up the road, dancing to the sound of fiddles, drums, and horns. Women, children, and old men stream into the band of weary, road-worn MEN. Shouts of joy and relief ring out as family members find their wandering men. A few call out names repeatedly, getting no response. 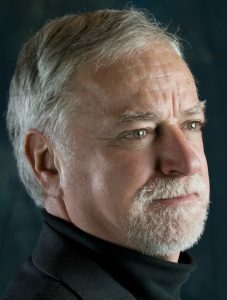 BOVA soon finds LIEZE, ADA and his three children, proceeding up the road amid a knot of followers and friends. The moment LIEZE spots BOVA, she runs through the crowd to greet him. ADA grabs MANDEH and DEKE, murmuring an admonition to let their parents say hello before rushing their father. BOVA looks like he would melt into his wife if he could. He sinks his face in her long chestnut hair, which she has allowed to flow loose for the occasion. Oh, my God, Lieze, I’ve missed you so! We’ve all been worried about you. Thank God you’re home and safe. BOVA kisses her face and then plants a passionate kiss on her lips. A couple of MEN nearby cheer this. LIEZE blushes. BOVA laughs, takes her hands and spins her around him exuberantly. ADA approaches with the three children. ADA and BOVA hug. The three children can no longer be restrained. DEKE jumps on his father, who easily lifts him for a hug. BOVA puts him down and greets MANDEH and ERYSA with hugs, too. The two younger children chatter excitedly at him. ERYSA’s manner is more contained; she has a natural dignity like her mother’s. The party of townspeople and returning fighters enters the town, many gravitating toward a park and paved square in the town center. BOVA and his family go with them. We have a wonderful dinner for you—a lovely lamb, and your favorite sweet winter squash, and two grand pecan pies… And we have so much to catch up on. Wait until you hear what the kids have been up to all summer! BOVA smiles and laughs in undisguised pleasure. What’s this son of mine been up to now? He’s started to learn his fencing. Lieze decided he’s getting big enough to start some lessons, so old [NAME] has been coming to the keep every few days to work with him. And he’s been helping Mandeh and Erysa practice with the bow. Is that so? Well, those two could shoot a walnut off a tree. And as for you, Mister Deke, can you hold your own against this Mandeh? O’course I can! I’m so good now, I bet I can beat you, Dad! BYSTANDERS laugh. MANDEH rolls her eyes heavenward. Alone among the Okan aristocracy’s fortifications, the Mayr of Rozebek’s keep formed a part of its village. Interestingly, the stage-play iteration of the scene that I wrote so unhappily came out with a great deal more detail and action, with new characters, and with some convincing forward motion. Writing stage directions forces you to articulate details that one too easily elides in writing narrative, simply because a fiction writer may have the large picture in his head and so presume that everyone else can see it. In a stage or movie script, you have to provide enough specifics to allow a stage designer, a costume designer, a director, actors, and a whole slew of other folks to bring that picture vividly to life for the audience. The momentum established by the genre switch allowed me to keep rolling into the next scene, which eventually will bring the mayr and mayreth (approximately the equivalent of a Middle English duke and duchess) Jag Bova and Lieze to the problem of how to address the large number of families whose men were lost during the summer’s disastrous engagement with the enemy. Shortly after midday, Jag Bova’s bands of weary, road-worn men crested the pass through the low hills that rose above Rozebek Town. Birds whistled in the hilltop forest, and a squirrel, still busy stashing acorns and pine nuts for winter, chattered shrilly as the men hiked past them. A hawk drifted overhead, looking for all the world like idle curiosity brought it to watching the procession pass. “And Willard? Did you bring my grandson back to me, Jag Bova,” Belindeh asked. “Whoa! Settle down there!” Semel shouted. A few marchers, rowdy and not inclined to settle anywhere just then, gave him uncertain glances. A ripple of laughter washed over the company closest to Bova and Semel. “That’ll give the girls something to remember through the winter nights,” someone remarked, boldly sarcastic. The band began to fall into rough order, and shortly two men with small bagpipes, a couple of drummers, and a fife player gathered at the head of the company. Meanwhile, Bova lifted bags of gear off his charger, loaded them on a pack pony, and climbed into the saddle. Semel scouted up company’s banner, unfurled it from its pole, and handed it up to Bova, who secured it to its saddle, where it waved cheerfully in the crystalline air. More to come. As you can see, a fair amount more is already in draft, ready to be transposed out of script format into narrative, description, dialogue, and whatnot. This strategy was time-consuming. But it worked. And I suspect it’s no more time-consuming than sitting for minute after minute and hour after hour staring at an empty page or a blank screen. 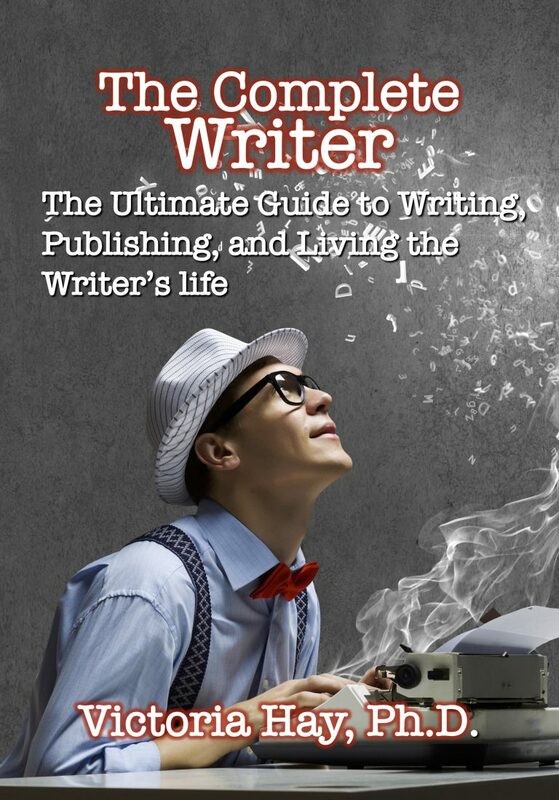 If you’re worth your salt as a writer, you’ll write several drafts anyway. Why shouldn’t one of the drafts be in a different genre? This entry was posted in Fire-Rider on June 9, 2016 by funny. Workload here has defied belief. That’s a good thing, I guess, because it’s quickly refilling the corporate coffers, largely emptied in the Amazon venture. But it’s meant no time for dreaming away an afternoon over the next novel or three. Light snow sifted sporadically from a pearl-gray sky over Moor Lek, collecting here and there but not working itself up into any serious drifts. 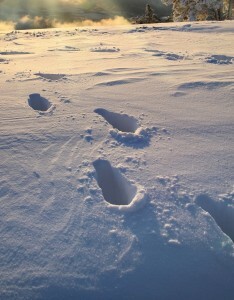 It was the first snowfall of the season to stick on the ground for any length of time. The people of Moor Lek, knowing what was to come, busied themselves at preparing for the deepest part of winter. Aniel, Kay’s foreman, was working in the barn, adjusting the horses’ shoes for icy conditions. The big gelding draft horse, in particular, needed snowball pads and studs, since he would be pulling a sleigh through snow and also often pulled a wagon or small carriage over the frozen road between Moor Lek Keep and the town. 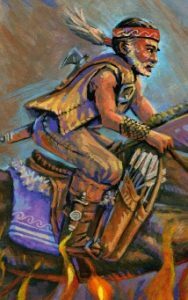 Demon, the great war horse grievously wounded when Kaybrel drove him through the fire to lead the men of Okan and A’o out of harm’s way after the Loma Alda debacle, would go barefoot for the winter, as would the other horses Ani didn’t expect anyone to ride. A few chickens strutted and clucked around the outbuildings, pecking for stray seeds and bugs. The children’s pet goat also idled about, never averse to a handout. The cows were out to pasture (what remained of it in the deepening cold), and the tame geese paddled in the stock pond, innocent of their destiny as centerpieces, some day, for some midwinter holiday feast. In the workshop that abutted the barn, Kay tossed another stick of wood into the stove he’d fired up. It helped to keep the chill away. Cold air drifted in through the open door that let in most of the light by which Kay worked. 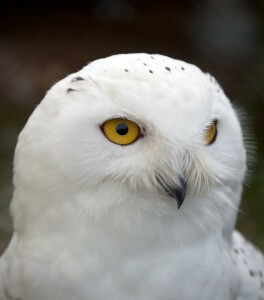 He was building a pair of snowshoes for Tavi, who had begun working in town for Jehm the weaver and his wife, Nina. The walk from the the defensive rise where the keep stood to the village below was a little over a mile, and if the boy was to walk back and forth six days a week, he would need the “big feet” come the first real snow. These little domestic jobs were the kind of thing Kay liked. He had split ash strips, steamed them, shaped them into curves in a jig he’d made, and left them to dry. The crossbars were attached, the tail ends secured, and now he was ready to weave the rawhide webbing into place. He could hear Ani, next door in the barn, whistling to himself as he went about his business, occasionally murmuring encouragement or gentle commands to a horse. One of the farmhands sauntered in through the wide barn door and spoke to Ani. Kay heard Ani tell the man to pump some more water into a horse trough and then go down the south pasture and repair a weakened stretch of fencing. Kay took a great deal of pleasure in Ani’s presence at Moor Lek, as he had always taken pleasure in him, ever since he had acquired him as a young refugee some years before from Mitchel Kubna of Cham Fos, Kay’s now deceased cousin. Ani, a farm boy from the outset, had grown into a strapping fellow, a more than competent manager for the keep’s farms and ranchlands. 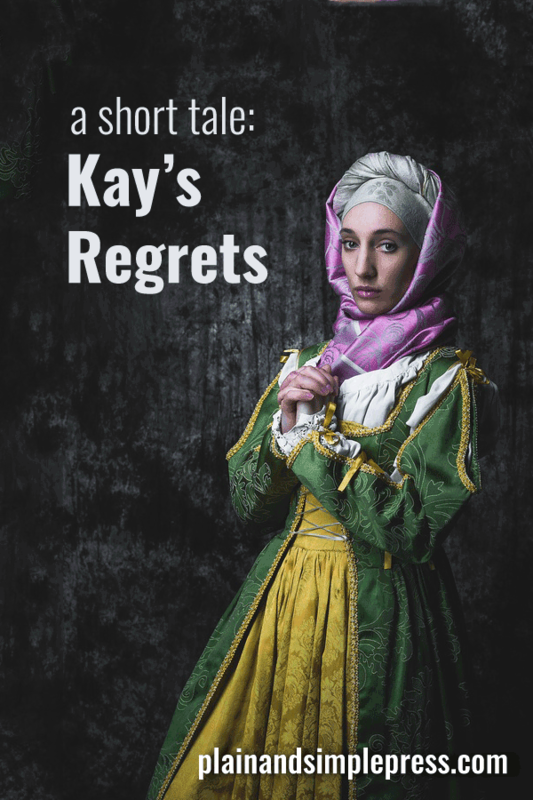 Lengths of rawhide wrapped and tied in place, Kay began plaiting them across a frame. His thoughts wandered. Pretty much against his will, they wandered back to the House of Puns and to the scene where he and Fol and the A’oan kubna Eddo of Bose had brought word of Rik of Puns’s death to his widowed kubnath, Larel. To what they had said, and to what they had left unsaid. This, Kay reflected, had been a fuzzy truth. They had no idea how Rik of Puns had died. If anyone had seen him fall, they hadn’t survived to tell the story. Only after the battle had ended and the remaining men standing gathered the wounded and prepared to flee did they find Rik half-conscious in a ditch, the blood of his life soaking into the dirt. Kay’s disagreement with Rik went unmentioned, as did his opinion of Rik’s idea of “honor” in battle. Nor did they tell her that Rik had died under Kay’s hands, that Kay’s knife digging for the slug in the man’s side may have dispatched him sooner than he would have died, one way or the other. Surely, he thought, by now that bit of intelligence must have reached her. These kubnaths, the ones born to the rank, were powerful and often daunting women. A kubnath or a mayreth grew up in the same training as a kubna or a mayre, although the emphasis for a girl child would be more on administration, politics, estate management, and justice than on warfare. Still, they did learn to ride and to wield a sword and bow, to build a battle strategy, to take orders and give them, just as their brothers did. 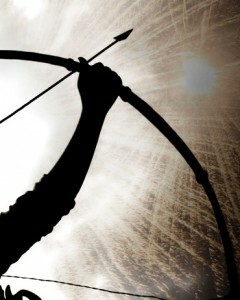 Maire, for example, could shoot an arrow as straight as he himself could. And a rifle, too. The storytellers spoke of a kubnath who would lead her men into battle, way back in the mists of time. Could Maire do that? Would she? He wondered. Probably not. But that Larel…he wouldn’t put it past her. Not only did she run the large and prosperous cowndee of Puns, she also was a religious leader – not a dreamy votary but a pricha, overseer of the cowndee’s several churches and spiritual counselor to her people. That added to her power. Considerably. In due course, Larel summoned her sister wives, Treese and Dodi, and in the men’s presence she passed their news to the two women. Kay caught a fleeting look pass from Treese to Larel. He wondered then and still wondered what that was about. Instantly, though, Dodi began to weep and sob, distracting attention from whatever was going on between the two older women. Treese wept, too. But Larel did not. Weeping was not what a kubnath did. Not in front of anyone, at least. He glanced up from his crafting and saw Jenna approaching the barn. She bore a tray with two pieces of pie and a big teapot from whose spout a delicate wisp of steam rose into the crisp fall air. “Time for a break, gentlemen,” she called. 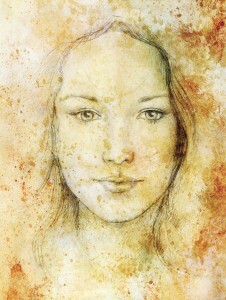 As Jenna entered the barn, Ani came forward to greet her, his face lit up with a smile. Married over three years, Kay reflected, and still in love with his wife. Well, he was still in love with Maire, and they’d been together longer than that. Maybe it wasn’t so remarkable. Still, he found it good. It was one of the many things, sweet as honey, that made him want to retire from the field. He wanted to stay home with his family at Moor Lek for the rest of his life. Kay set the snowshoe frame down and followed Jenna into the barn, where the two men sat down at a small, rough-hewn work table. Jenna set the plates of pie in front of them and poured hot herbal tea into a pair of tin cups. Then she pulled up a milking stool and kept them company while they ate. “Are we going to the autumn rodeo at Silba Lek?” she asked. “Could be,” Ani said. 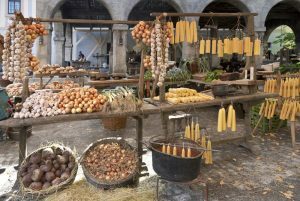 At this time of year, with the crops in, splits collected from and redistributed to the cowndee’s townspeople and farmsteads, and most of the winter’s wood chopped and split, the workload slacked off. Sometimes he could quit working early, though usually he would find enough to do to keep himself busy until sundown. “We could probably do that,” he said as he finished up his pie and stacked Kay’s empty plate atop his own. Kay noticed a little twinkle in Ani’s eye and remembered long, lazy rides through the countryside with Sellie,* so long ago, in a different lifetime. She rode a pretty paint with a smooth, easy gait, an animal she handled well and that, he thought, was almost as pretty as she was. In its way. “If we’re going out this afternoon, then I’d better get back to work now,” Ani said. He stood, wiped his hands on his work pants, and gave Jenna a peck on the cheek. That meant, Kay thought as he ambled back to the workshop, he and Maire would have the kids this afternoon. But they might be napping, if Ani and Jenna got an early enough start. That could be interesting. This distraction over and possibly a better distraction in the offing, Kay returned to his work. 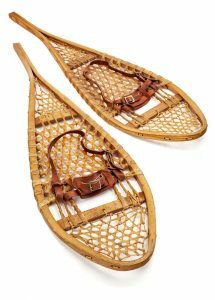 He had about completed one snowshoe—just a little more remained to fill in the webbing. He set it aside to attend to a still that gently percolated atop the wood-burning stove. The fire’s temperature needed to be watched and kept fairly steady. Too much heat could ruin the distillation; too little would cause it to fail. 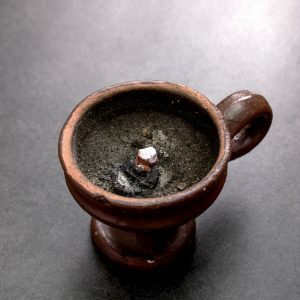 The medicament this would make, when infused with three of the curative herbs that grew in his garden, could soothe rashes ranging from poison oak to impetigo and even, he’d discovered by accident, eliminate dandruff in one’s beard. He liked to have plenty of this dandy snake oil on hand. Too bad, he thought, too bad he didn’t have some potion that would stanch bleeding. If the Bishop, his mentor during his too-short time within the walled stae’ of Uda, knew of any such thing, he hadn’t taught it to Kay. Maybe he could have saved Rik’s life if he’d had something that would work that way. Did Rik die, he wondered, because of what I did? Did he die because of what I didn’t do? Because of what I didn’t say? Like a dog worrying an old bone, he couldn’t let it go. Try as he might to bury it, the thing wouldn’t stay buried. That old man who had come out of the bush to beg the Hengliss bands to spare his family’s farmstead…what had Kay been thinking to tell him to take his people into the hills after Lhored had ordered him to tell the man, in Espanyo, to send his young men down—to be killed, obviously—and then maybe the place would not be leveled? Into the hills? For God’s sake. From the hills they would have been able to observe which way the bands went. They would have seen where the Okan and A’oan warriors were headed and by which route. The horse tracks in the barn that Kay and Fal rousted…at least two, maybe three animals had been taken out of there very recently, probably as the Hengliss bore down on the place. The old man had come back on foot. So who rode those horses? Did Fal realize that someone must have headed out from the farm on horseback shortly before the war party arrived? Did he sense that Kay had told the old man something different from what Lhored asked him to say? Did Fal, even though he couldn’t understand enough Espanyo to ask politely for a roll in the hay, guess that Kay had lied about what he’d said, and about the old man’s response? He had lied to another kubna. Worse, to his own brez. Did that lie bring the disaster of Loma Alda down on their heads? *One of Kay’s first wives, long deceased. This is a work in progress from a new novel in the Fire-Rider series. To get the back-story, grab one, two, or (preferably!) 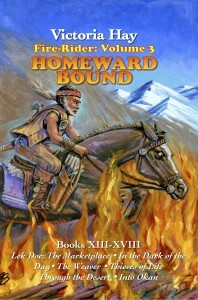 all three of the stories in print now: The Saga Begins, Fire and Ice, and Homeward Bound. You can get all three at Amazon (live links in the right-hand sidebar →), or, if you’d like a print copy, get in touch through our Contact page. 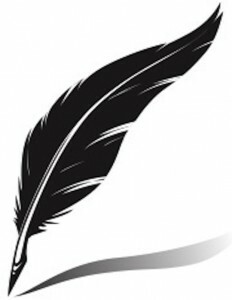 A tale of the Tale can be found here, and to see all the Plain & Simple Press offerings, fiction and nonfiction, visit our Books page. This entry was posted in Fire-Rider, Monthly Riff on May 16, 2016 by funny. Alas, your revered publisher has been remiss in posting the promised weekly — make that “monthly” — riff from future Fire-Rider tales. So much paying work has come flooding in to our parent company, The Copyeditor’s Desk, that I’ve had no time to do anything more than cope with the tsunami. But we have a brief respite before the next two projects hit the beach, so now’s our chance to play for a bit! 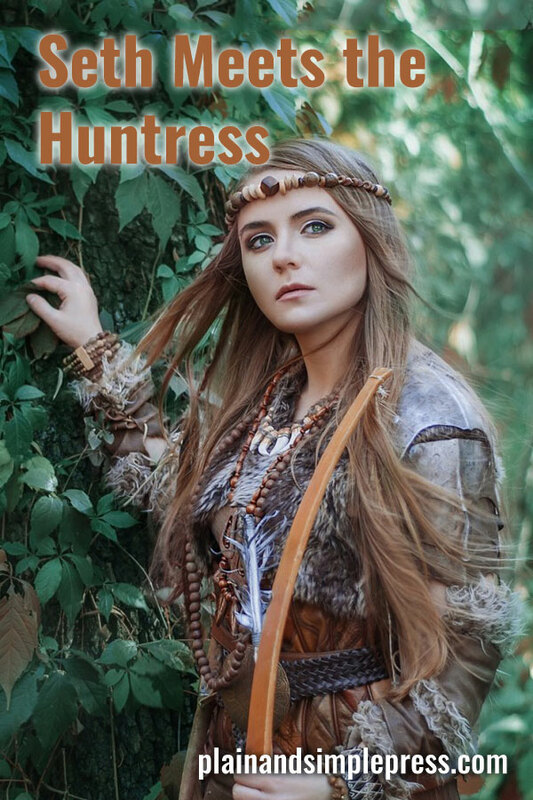 You’ll recall that Seth, ranch foreman for Fallon Mayr of Cheyne Wells, visited the fur and clothing shop run by Caddy and Linaya, one a huntress and the other a tanner and tailor. Caddy, daughter of Fallon’s man for all seasons Tobias, baffles Seth: he doesn’t know quite what to make of a woman who seems to be, as he privately opines, “all boy.” But she has reported seeing a wild woman running loose on the northern range, and Seth, as concerned about poaching as about the stranger’s welfare at the start of an ice-age winter, has suggested that the two of them go in search of her. Caddy agrees, and the two head out together for the trapper woman’s most distant hunting ground. 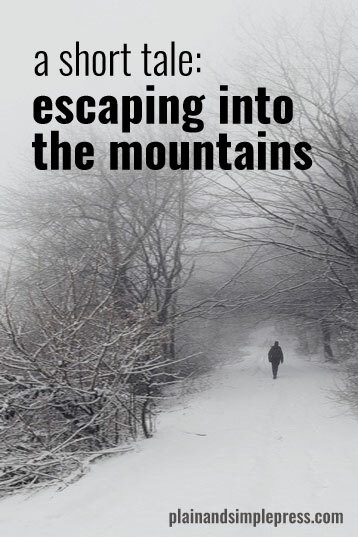 Caddy was right, as Seth knew she would be, when she said the day would be too short to give enough light for them to make a round trip from her trapper’s cabin to the section of her trapline where she had seen the woman. Under a cloud cover, darkness came in long before they began to feel tired. They had gathered several rabbits and a mean wolverine from Caddy’s traps. And she had surprised Seth by releasing a coyote, uninjured, from a trap. “Why didn’t you kill it?” he asked, an edge of annoyance to his voice. Seth couldn’t think of an answer offhand and he sensed that if he could, he probably should keep it to himself. As they hiked across the coarsely forested landscape, they searched for tracks and spoor that might alert them to the stranger’s presence. They found precious little. At one point Seth, frustrated with the absence of any clue at all, asked her if she was sure she hadn’t seen a deer in the gloaming. They continued in silence, walking northward over light snow and the occasional damp humousy forest floor. It was strangely quiet, Caddy thought. No birdcalls. Not even the sound of the breeze sifting through the pine and juniper. Maybe it was just because it was so still this afternoon. With no wind to cover the racket of the two of them tromping around, they must sound like a herd of bulls moving through the brush. Must have scared off the wildlife. This far north, miles above Cheyne Wells, they were approaching the edge of the permanent ice sheet. Most of the little streams were frozen by now, although a few still trickled with pale blue-green glacier melt. “What do you say we camp here?” Seth said. They had come upon a dry, level patch where a partially flowing stream had cut in below the bank. Caddy agreed that it was a good spot. They unloaded the two mules and pitched their lodges. Caddy had picked up some firewood and kindling as they passed through the occasional copse. She set a campfire going while Seth climbed down into the riverbed with a couple of buckets to fetch some water for cooking. She had just got the tinder lit beneath the kindling when she heard Seth call her. “Come on over here, will you?” he yelled. “What is it?” she asked as she approached. He pointed to a smudged, half-filled-in set of tracks in the mud. The cold ground and water had pretty well obscured most of them, but they could make out a few. “Bet this is your girl,” he said. Caddy studied the tracks. Then she stood and set her own foot next to one. “Her foot is bigger than mine, even with my boot on,” she said. “I’d have sworn she wasn’t any bigger than me,” she said. “Hard to tell, from a ways off,” Seth replied. Caddy butchered a rabbit that she had gutted and skinned after retrieving it from a trap, and they cooked it over the campfire. They simmered some grain in the water Seth had carried up from the stream and, as darkness closed in around them, enjoyed a decent enough meal. After they gathered their provisions and hoisted them, packed in a bag, onto a tree limb out of bear’s reach, they sat down to enjoy the last of the campfire’s warmth. Seth offered to share a pipe of imp with Caddy. A born mountain man, Seth reflected silently. He wondered where she picked up such a thing. Certainly not from Tobias, who was not what anyone would call the outdoor type. “Must have been a surprise to find you had company,” he remarked. “You surely could say that!” She laughed. “And it wasn’t a bear?” he asked, after a moment had passed. One of the mules nickered. Then a single loud bray burst out. Caddy stared into the darkness. The two of them fell silent, listening. He puffed on his pipe, soaking up the mellow, sweetish smoke. 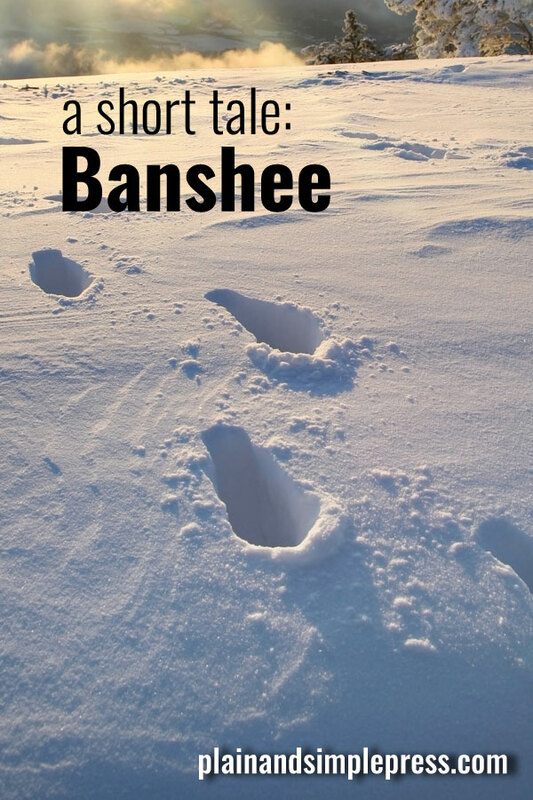 “What d’you suppose she’s doing out here, running around barefoot in the snow?” he said. She chuckled quietly and picked up a stick to stir the fire’s embers. An owl hooted in the distance. Then her hand froze in place. “It is odd,” Caddie agreed. Down the way, their two mules jostled each other, yanked against their tethers. If they hadn’t been hobbled as well as tethered, they would have bolted. “What do you suppose it was?” Seth asked. Seth hauled himself to his feet. “Going to turn in?” Caddy asked. She got up, took her bow in hand, and followed him into the darkness beyond the fire’s circle of light. Both animals were nervous and jittery. Seth’s mule showed the whites of his eyes in the faint glimmer of the campfire, yards distant from where the two beasts were tethered. “Whoa, Jonniboy, easy now,” Seth crooned as he approached them. “It’s gotta be a lion,” said Caddy. “We should take them over near the lodges.” She moved closer to her own animal, which she called Molly. Caddy stepped out and away from Seth to put herself firmly in Molly Mule’s line of sight. 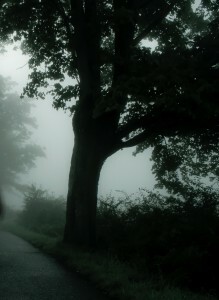 Just as she did, out of the corner of her eye she saw a black shape plunge out of the tree that sheltered the stock. Before she could utter a sound, the shadow slammed down on top of Seth. Flattened on the ground, face-down, Seth struggled to regain the breath that was knocked out of him. Before he could begin to figure out what was happening, the thing attacked him. He felt blows—kicks?—to his back, and it—a woman, could this possibly be a wild woman?—had its hands around his neck, squeezing. He shoved an elbow backward, made contact, hard enough to loosen the grip around his throat for an instant, long enough to gasp in some air. “Caddy! Run, girl!” he cried before the hands closed around neck again. Maybe she’s already taken off, he thought. He fought to turn over and shove his assailant away. The harder he fought, the heavier the other seemed to get. Air cut off, Seth was drifting into unconsciousness. So this is what it’s like to die, he thought, strangely calm, even uncaring. Dying didn’t seem to matter…though he wouldn’t mind taking this other with him. The weight on top of him seemed to grow heavier, heavier and quieter. It stank, smelled of musk, skunky. Limp, it was. It was rolling off him. Caddy was there, kicking hard at something. His lungs drew a breath of cold air into his chest, and he grunted. “Are you all right, man? Come on…get up!” She was kneeling beside him and shaking him, as if to wake him from a sound sleep. Had he dreamed it all? He pulled himself up on his elbows. His attacker lay beside and partly across him, an arrow through the back and another through the side of the ribcage. He pulled free of the other’s weight. She took his arm and pulled him to his feet. They stood and stared at the dead thing on the ground. “What in the name of God is that?” Seth wondered. “It’s not a woman, is it?” Caddy replied. Covered with thick, long fur, it had distinctly unfeminine gonads. 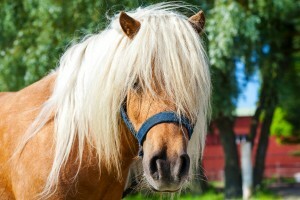 The mane growing out of its head and neck had looked to Caddy, from a distance, like a woman’s hair flying in the wind. They stood back and looked at the body. “Did you kill it?” he asked. “Not bad marksmanship,” he said. “Thank you, sir,” she said. “Maybe it’s a demon,” she said. They stood staring in awe at the inert form, its face almost human but yet not, massive and hulking, its body covered in coarse hair. He considered the arrows in the creature’s back and chest. Either of them would have killed it. She must have drawn and shot her second arrow in less than an instant after she got the first off. Both hit home. By firelight. Seth stood staring at the corpse. “Are you all right?” Caddy asked him. She gave Seth her bow to carry, released the leather hobbles from the mules’ feet, and took their leads in hand. They walked back to where the lodges stood next to the waning campfire. Caddy didn’t like the looks of Seth’s stiff gait. If he was pained now, what shape would he be in by the light of dawn? The animals re-hobbled, she dug out her first-aid bag and helped Seth out of his jacket and shirt. He was bruised, scratched, and gouged, but not too much the worse for wear. She guessed. If he had a broken rib, to say nothing of two, that might not be good. But one way or the other, about all she could do was bind him up and pray for the best. “You could bring Linaya with you,” he suggested. “Surely,” she said. If Seth had been Linaya, he would have recognized Caddy’s tone as one she used when she meant exactly the opposite of what she said. This is an excerpt from a future volume of the Fire-Rider saga, yet to be published. 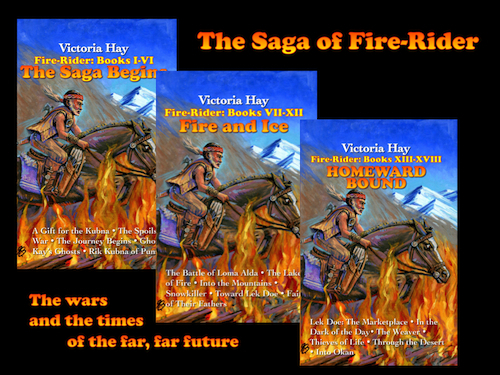 Don’t miss the first three Fire-Rider novels, The Saga Begins, Fire and Ice, and Homeward Bound. 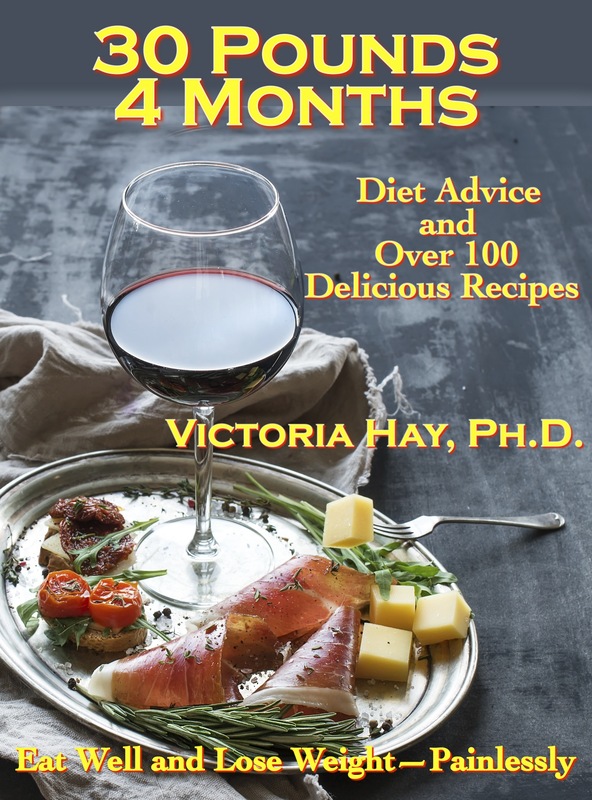 Available in handsome print versions here at Plain & Simple Press or in Kindle format through Amazon. 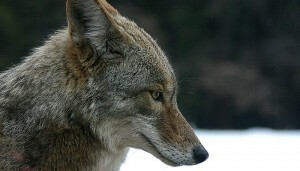 Coyote: Coyote profile: Christopher Bruno. StockXCHNG. Creative Commons Attribution-Share Alike 3.0 Unported license. This entry was posted in Fire-Rider on April 26, 2016 by funny. 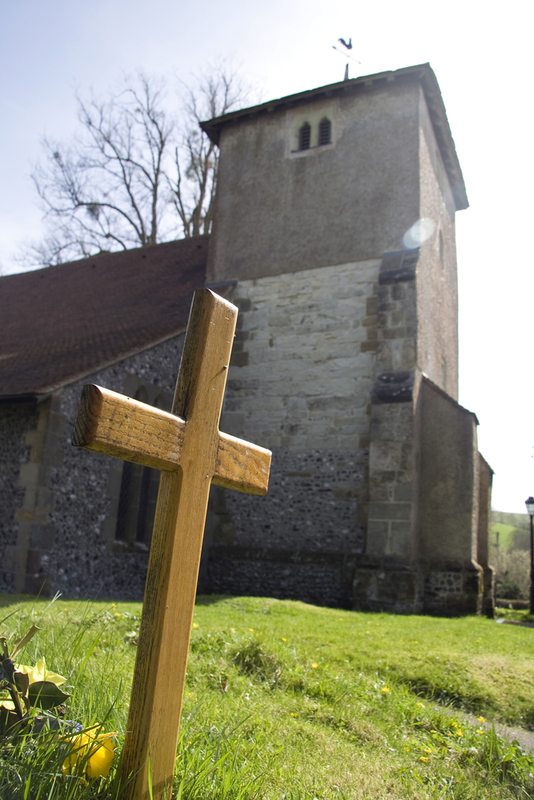 This short out-take from the next Fire-Rider book takes place in the village of Cheyne Wells. 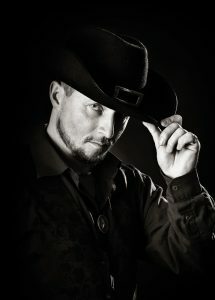 Seth is the ranch foreman for Fallon Mayr of Cheyne Wells, whose vast holdings extend to the edge of the northern glacial ice sheet. Linaya and Caddy are a lesbian couple. 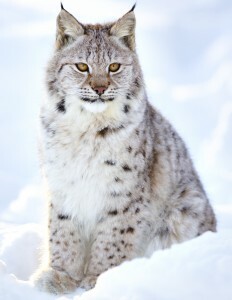 They support themselves by selling clothing and other supplies made from hides brought in by Caddy, a skilled trapper. Caddy also is the daughter of Tobias, Fallon’s dwarfish household manager and, in the hierarchy of the mayr’s servants, Seth’s opposite number. Seth has long regarded Caddy with a degree of curious skepticism — “all boy” has been his opinion of her — but that is about to change. 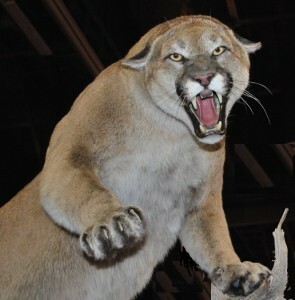 Seth stepped inside Linaya and Caddy’s taxidermy, fur, and clothing shop, one of Cheyne Wells’ most prosperous businesses. A stuffed owl watched him through yellow quartz eyes while a long-defunct marten stalked a nonexistent rodent across a dusty tabletop. A stack of fur rugs occupied one corner, near another pile of sheepskins. Fur- and fleece-lined coats and jackets hung from wooden rods that spanned the cave-like store, and a set of shelves displayed a collection of warm fur hats. A musty, leathery scent filled the space. Set in the center of the store, a small wood-burning stove provided nominal warmth. The season’s first real snowfall (as opposed to rain spitting ice) had let up, leaving a thin layer of white on the ground. Though Seth felt no fondness for dim enclosed places, he was glad to get inside where the chill had been taken off. With winter coming in, Linaya’s thick, richly lined jackets looked mighty appealing. He considered whether he could buy one. What would the women take in trade for one of those fine sheepskin jackets with fox or rabbit fur lining the hood? A tinny bell rang when he opened the door. In due time Linaya, tall and slender with aquiline features and dark, short-cropped curly hair, entered through the back door. “Well, Seth!” she said. “How good to see you!” She sounded genuinely pleased to find him in her shop. After some small talk, maybe too brief on Seth’s part, he asked if Caddy was there. “She is,” said Linaya. “We’ve been outside tanning some pelts.” She stepped to the back door and called to Caddy. Shortly, the trapper woman appeared. Seth towered over her, as he towered over her father, Tobias. She wore her straight blond hair shoulder-length; this afternoon she had on a fur-trimmed wool cap, as if to hold the hair in place while she worked. Linaya sat them at a table behind the stove and poured a couple of mugs of hot apple cider. He liked that she went straight to the point. Few things made Seth more uncomfortable than trying to dream up polite, mindless things to say by way of backing in to whatever really needed to be said. She considered: he had a point. Cattle and horses were valuable commodities. It wouldn’t do to have a neighbor lose one to some half-crazed soul roaming around the bush. Especially when that neighbor happened to be the local warlord. “I think I could manage that,” Seth replied. Across the room and out of Caddy’s line of sight, Linaya raised an eyebrow. What Caddy didn’t see, Seth did. “Good!” he said. “We leave the morning of the fourth day from today.” He extended a hand as he would to a man, for, after all, she was a kind of man, he supposed. She stood and took his hand in a firm and friendly grip. “The fourth day, then.” A broad, frank smile crossed her face, and in that moment her eyes lit up, the brightest sky blue he thought he’d ever seen. This is a free, monthly riff on the Fire-Rider saga, the story of a post-Global Warming people living in a far distant ice age. The story of Caddy, Seth, and Linaya will appear in the fourth volume. Just now, volumes I through III can be had at Amazon or, in print, at Plain & Simple Press. You can see all our offerings at our Books page, and order any of them in print by sending a message through our contact form. Curious about what happens next? This entry was posted in Fire-Rider on March 16, 2016 by funny. Woo Hoo! ALL of Fire-Rider’s in Print! We’re happy to announce the print publication of the entire Fire-Rider saga, in three handsome paperback volumes. Available in print only through Plain & Simple Press, the three books tell the story of allied warrior bands making their way through a post-civilized future world. Reminds me of Robert Adams’ Horseclans series in the way you can dimly see the strands of our present world shimmering in the fabric of a far-future United States. . . .
What would our world be like if civilization failed? . . . A bit like David Brin’s The Postman only darker and more adult themes. Don’t miss the print books! Read them. Show them off. Get sand in them at the beach. Drop your popcorn on them. Read them in the bathtub. Drop them on the floor. Lend them to your friends. Leave them to your heirs. They’re all yours, and they’re not inside an electronic device! To get your copy, drop us a line through our Contact page. This entry was posted in Fire-Rider on March 3, 2016 by funny. Like their brothers, fathers, and husbands, the women of the Great Lacuna‘s warrior class — the kubnaths and mayreths, depending on their inherited rank — were trained in the arts of war. A few, such as Bett Kubnath of Huam Prinz and Cham Fos, were renowned for a certain ferocity of character. But, Hapa Cottrite tells us in his journals, “rare it was for a woman warrior to lead a band into the field.” Rather, they served as administrators, judges, and (at least in some cases) absolute monarchs. The women decided who got what portions of the shared crops and war booty (“splits”). The women heard the people’s cases in law and decided whose plea held the most weight. The women assessed claims of evil-doing and passed judgment on those found to have erred. In a distinctive vignette from the Cottrite Chronicles, Lieze Mayreth of Rozebek awaits the return of her spouse, Jag Bova Mayr of Rozebek, delayed by the troubles of Loma Alda and Lek Doe. This passage is especially significant for the insight it gives to the marital customs of the Great Lacuna, a time when women far outnumbered the men, who had been picked off by disease, war, and the harsh conditions of the Ice Age. 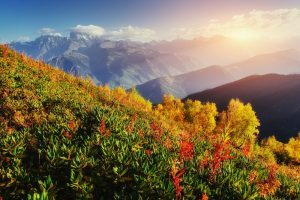 Lieze stood at an upper window of Rozebek Keep and gazed out over the broad, spreading fields toward the distant blue mountains. As the days grew shorter, she reflected, the problem grew larger. What to do? she wondered. And where was Jag Bova? When would he be home? The men should at least have reached Krens by now, and really they ought to be at Oane Lek. But surely, if the bands of Oane Lek and Puns had arrived at Oane Lek Town, some word of it would have reached Rozebek. Lieze’s mother, Ada, came into the hall and found her daughter staring pensively into the distance. “I can’t remember the men ever being this late before,” Ada said, reading her thought. The two women descended the curving stairway, its heavy oaken banister tracing an elegant arc from the second story to the ground floor. There they found Lieze and Jag Bova’s two daughters and young son tossing a ball around the great hall. “But Mother, it’s cold outdoors,” Mandeh protested. At twelve the younger of the two girls, Mandeh was always full of ginger—and backtalk. Erysa, the older sister, began to shepherd the other two outside, handing her little brother Deke a coat and knitted wool scarf, passing another jacket to Mandeh, and wrapping herself in a warm fleece sweater and matching hat. Lieze poured a couple of mugs of hot minted apple cider, and the women sat down at the kitchen table. They watched the children through one of the tall, narrow windows that looked out onto the keep’s courtyard. Lieze gazed at the lithe girl beneath the window. If “girl” the child was, she thought, she wouldn’t be for much longer. Erysa already looked like a young woman. Albeit a very young one. “I was nineteen when I married Jag Bova,” she said. “Yes,” Ada allowed. “But Erysa is quite pretty. 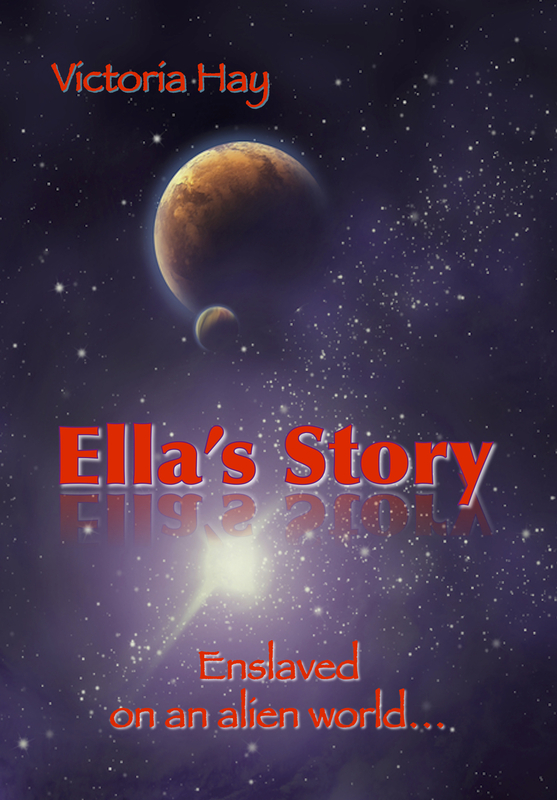 She’s already started to attract the boys’ attention.” Erysa had her father’s honey-blonde hair and blue eyes. Though she was a sturdy, healthy girl, she hadn’t inherited Bova’s massive build. Her budding femininity lent grace and sweetness to her slender frame. “Oh, so I wasn’t pretty enough to need to be married off early?” Lieze said in a mock tiff. “Well, when Bova gets back, maybe we should start to talk about it.” She had no intention of bringing the subject up, and she hoped Ada would forget it before long. She outlined a strategy that had come to her while she lay awake at night: They would recruit every able-bodied elderman, woman, and half-grown child on the nearby farms and from the town and divide them into teams. Each group would be assigned to visit a number of farms, over a couple of weeks, and help the residents reap the harvest and pick the fruit. Many hands, she observed, make short work—and despite the absence of the men of fighting age, enough town and farm dwellers remained to make up at least three or four teams. “Give them extra splits,” said Lieze. Splits were the shared goods owed from every individual to the mayr or kubna. These were organized and redistributed back to the community, the recipient returning half of the take to his or her followers in a way that the leader deemed fair. Lieze, too, had considered the reaction her husband might have. “But Bova’s not here,” she said. 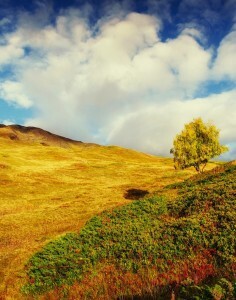 “And wherever he is, he doesn’t have to deal with a fall harvest that’s about to rot or freeze on the vine. “That’s quite a job,” said Ada. “Yes. But it’ll get done. Mandeh’s plenty big enough now to help with both the harvesting and the canning. You can teach her whatever she doesn’t remember from last fall. Pleased with the ingenuity of this scheme, the two women lingered over their warm cider. “It’ll be lovely to spend a whole day with just one of the grand-daughters,” Ada said. Uh oh, Lieze thought. Now what? Lieze looked at her mother with something like shock in her face. Lieze blushed. “I don’t feel any need to be relieved,” she said. 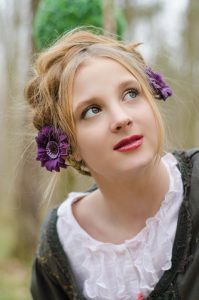 Truth to tell, Lieze thought, her mother had something there: now that Erysa was almost grown, she could take on a fair amount of the work, and she had become a big help. Whether or not they put any thought into the matter now, in just two or three years, the girl would be a woman and a wife—in her own or another woman’s household. Maybe Ada was right. Maybe they needed a junior wife at Rozebek Keep. On the other hand, if Ada took on the project of finding Jag Bova a second wife, it would distract her from trying to marry off Erysa. This entry was posted in Fire-Rider, Monthly Riff and tagged weekly free Fire-Rider riff on February 17, 2016 by funny. FREEBIE TIME! 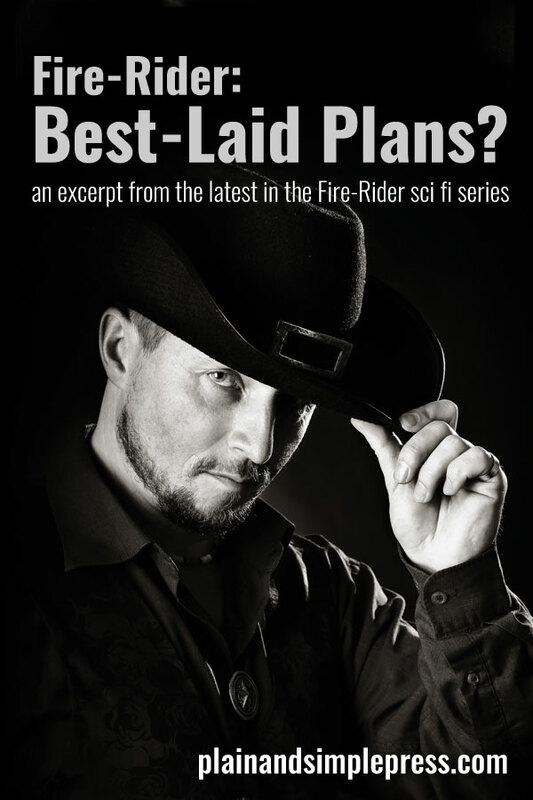 Each week, Plain & Simple Press will publish a free riff on the Fire-Rider saga: fresh anecdotes or insights in to the characters or the action, entirely NEW, never-before published. Because blogs are short form, we won’t have space for a lot of detail. For context, visit the Fire-Rider website or, better yet, immerse yourself in Kaybrel’s world with the three Fire-Rider collections — links to e-book versions are on the left, or, if you prefer, the print books shown on our Books page can be ordered through the Contact form. You can get a quick grounding in the story with the first two or three short serials, whose links are also at Books. In our first riff: Following a disastrous engagement, the allied northern war bands have escaped into the mountains. It is after dark by the time they set up camp along the main road leading through the Dona Paz toward their goal, the merchant town of Lek Doe. Kaybrel has treated his friend Fallon’s wounded leg and left him with his camp boy, Tavio, while he spends several dark and cold hours applying his healing skills to the injured survivors of the Battle of Loma Alda. At last his labor pauses and, half-frozen, he beds down between his companions seeking warmth and sleep. “Were you scared during the fighting?” Tavio had asked him. Sleepless in the dark night, Kaybrel turned the question over in his mind. Fallon, his second-in-command and probably the best of his men, slept to his right and the boy to his left, he — Kaybrel — sandwiched between them to soak up their warmth after the icy hours he had spent tending to the wounded and the dying. Tavi, he was sure, had also fallen asleep. The lad’s breath came in steady, measured beats, hard to fake. The rain pattering against the lodge’s waxed canvas and hide walls was turning to sleet, so he judged by the sound of it. The whole damn place where they were perched along the Dona Paz Way would be frozen solid by dawn. If the fog and clouds didn’t clear, it would stay frozen all day. Was I scared? he thought. Where does the kid come up with questions like that? Too smart by twice, not wise enough by half. A sharp gust whistled through the nearby trees. 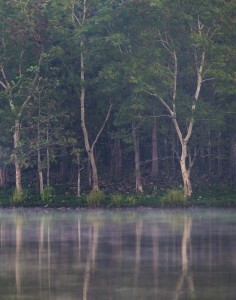 Water blew off the boughs and splattered across the forest floor like an extra splash of rain. No. No, he wasn’t scared. Not on the field. There wasn’t time for that. Enraged, maybe. Hyper-alert, for sure. Exhilarated, even. But scared? Not exactly. Not until he was up on the side of the mountain with his crazy cousin, Binsen, and Jag Bova. When they almost lost Bova: in all this business, that was the first time he felt real fear. He was nervous, of course, hauling up a draw toward a road they couldn’t see, God only knows who or what waiting for them up there. You’d be crazier than Binz if you weren’t nervous. Binsen made him nervous. Batshit as a wolverine, he was. Fal snorted softly and shifted in his sleep. 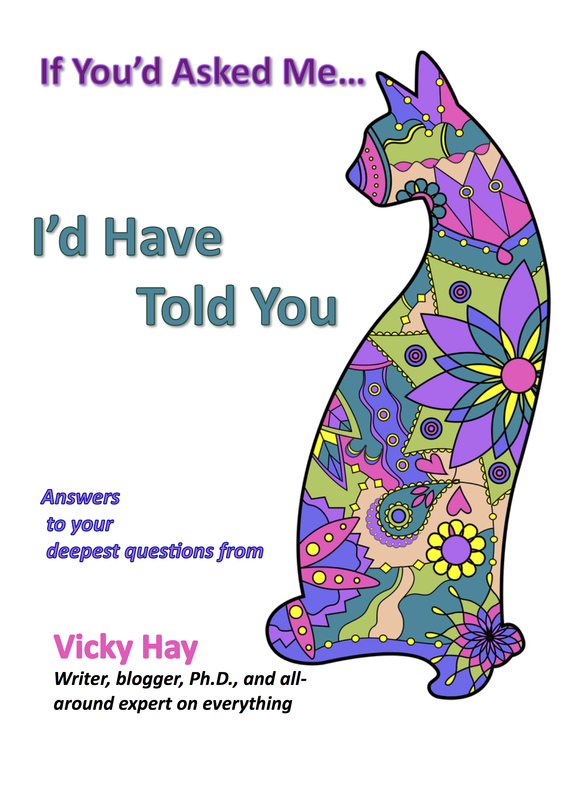 Kay could feel him subside even deeper into blessed unconsciousness. The gale moaned off the edge of a cliff, keening like the wind swirling around Moor Lek Keep’s great tower. Moor Lek: he wished he was home. Would that it were Maire beside him, not a grimy boy and a bloodied man. Where was sleep? So dark it was, so late: he knew that if he could see the stars on the other side of the clotted sky, they would tell him half the night was gone. People liked to say he had the Gift. Gift, God help him. He wished he had Fallon’s gift: the gift of falling asleep before his head hit a pillow. Beneath the restless clouds, the night moved on. Dark and cold hours: Shutterstock. © 2016 andreiuc88. 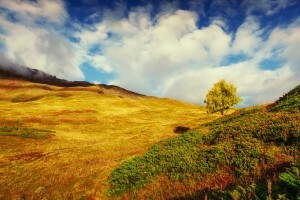 Kaybrel: Shutterstock. © 2016 Captblack76. When they almost lost Jag Bova. © 2016 Michal Knitl. 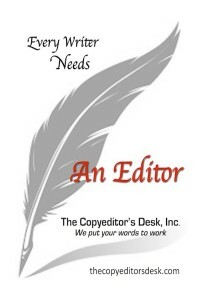 This entry was posted in Fire-Rider, Monthly Riff and tagged Fire-Rider, free story, weekly free Fire-Rider riff, weekly free story, weekly riff on February 10, 2016 by funny.